Nogginmama: Clay Ornaments at Kiwi Crate! We finally put up our tree today, so I was able to snap photos of our ornaments hanging. Thanks to Kiwi Crate for getting me crafting. My Christmas spirit is finally up and running. 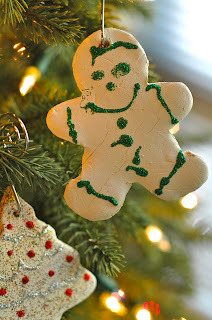 Have you gone to their Facebook page and posted your DIY Christmas ornaments yet? P.S. It feels wrong to me that our bought ornaments are made in very far away places. Making our own ornaments feels much more in alignment with my values for Christmas.